"The sauce was created in Ulster County, New York. 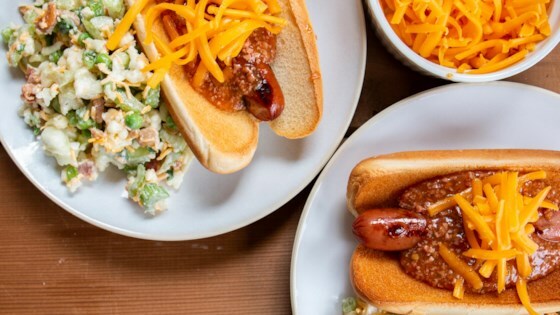 The sauce turns a ordinary hot dog into a mouth-watering meal. The hot dog is served on a steamed bun with mustard, chopped onions and then the sauce. Enjoy." Grind hot dogs into a chunky paste in a food processor and place into a large saucepan. Mix cornstarch with 1 cup water in a small bowl and set aside. Pour 7 more cups water over the hot dogs. Stir in vinegar, paprika, chili powder, sea salt, red pepper flakes, oregano, onion powder, cinnamon, white pepper, and black pepper and bring to a boil. Simmer over low heat until the sauce is slightly thickened, about 30 minutes. Gradually stir in reserved cornstarch mixture and simmer for 15 more minutes. Adjust salt and black pepper. Sauce will be thinner than chili and will thicken as it cools. See Chef John's technique for cooking tremendously juicy steaks on your stovetop. Just remember the buns need to be steamed. I do mine in the microwave for 30 seconds. Without the steamed buns it's not the same, and it's better to boil the hot dogs and not grill them. I'm sure one thinks, wow ground up hot dogs! Hmmm? Nobody asked me what the mush was in the sauce and everyone loved the sauce. Just the perfect amount of spiciness.